As seen the in the figures of the power source circuit, the circuit is comprised of components such as resistors, capacitors, and other components. The input capacitor is used to help smooth out input variations. The resistor is used to adjust the current limit and control the peak switch current. The output capacitor helps smooth out the dc output voltage as well as provide energy storage. The inductor stores energy when the circuit is on and sends the stored energy back to the load when it is off. The boost capacitor improves the efficiency of the regulator. The diode allows current to flow through it when the regulator is off and when current is flowing from the inductor. Further specifications on what kind of components can be connected with the switching regulator can be found in the datasheet of the LM2679 switching regulator. 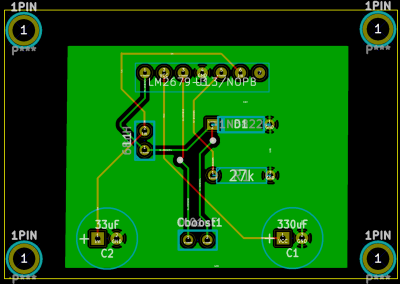 The PCB shown is just a simple example of how the circuit can be configured onto the board. It is up to the user to configure a PCB with their own sense of organization. 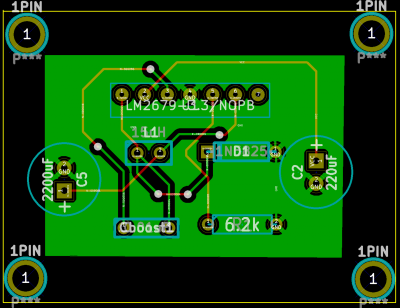 With this aside, the PCB should function similarly to the power circuits, and then be applied to their objectives, which are the micro-controller and IR LED ring. This page was last modified on 21 May 2015, at 23:17.